Collecting Antique Clocks: The Lantern Clocks of Thomas Power of Wellingborough. Thomas Power is hardly a well-known clockmaker. In fact I have on my bookshelf a copy of an old catalogue of an Exhibition of Early Clocks and Watches at the Central Museum & Art Gallery in Northampton held in 1966, and at that time his name did not even appear in their list of local makers. Nor was he in the standard published lists. I think I am right in saying that his name appears in print for the first time in my book, Volume Two of Watchmakers & Clockmakers of the World, published in 1976. Even today we don't know a lot about him. He is believed to have been born about 1630, to have worked in Wellingborough (which he spelled consistently as Wellingborow) from the 1660s till his death there in 1709, one source says aged 79. There was at one time a suggestion that he worked first in London, or that there were two different makers of the same name, one who worked in London and one in Wellingborough. However I feel sure this is an error. It seems to have arisen from the fact that some of his clocks are signed without the placename. This is something that we recognise today as usually being a feature of a maker working in some rural location, whereas London makers were pretty well obliged by law to sign with their place of work. As a very general rule therefore we can assume that if a clock does not carry a London address, it was not made in London. One of Thomas Power's lantern clocks offered for sale some years ago (1976 in fact) by clock dealer Meyrick Neilsen of Tetbury, was signed without any place of origin and was presumed to have been made in London, a view often taken in those days, whereby anything of merit was assumed , without any evidence and probably on this presumption, to have come from London. This led to a 'London' maker of this name appearing in the standard texts, quite incorrectly I think. In fact the only evidence from which we can deduce Thomas Power's period of working in Wellingborough is the estimated dates of his clocks - and not very many of those are known, and, being based purely on style, any assessment of their dates is a bit of a guessing game. I know of seven lantern clocks and two longcase clocks by him. I have kept records for many years, with illustrations where possible, of all the lantern clocks which came to my notice, especially those going through auction. I have a description of all seven, but illustrations of only five of them, and most of those are not of adequate quality to reproduce here. By studying what we can of these it may be possible to see a progression of style which helps with dating and setting the clocks in chronological sequence. It may help if I detail the salient points of these clocks below. Lantern clock: Thomas Power Hoc Fabricavit. Meyrick Neilsen's clock of 1976. With alarmwork. Balance wheel escapement. Slim chapter ring. Date 1660s?. Lantern clock: Thomas Power Hoc Fabricavit. Privately owned, reported in Bedford in 1994. No alarm. Verge escapement. Details otherwise unknown. Date unknown but guessing by signature at 1670s. Lantern clock: Thos. Power de Wellingborow Hoc Fabricavit. Auction 2002. Formerly with alarmwork. Verge escapement. Slim chapter ring. Date 1670s? Longcase clock: Tho: Power de Wellingborow Hoc Fabricavit. Narrow chapter ring. Verge escapement. Plated movement and not otherwise comparable with lantern clocks. Date mid 1670s? Lantern clock: Thomas Power de Wellingborow. Auction 1985. No alarm. Anchor escapement conversion (from verge?). Date unknown but guessing at 1680s. Lantern clock: Thomas Power in Wellingborow. Privately owned reported in 2003. Anchor escapement conversion (from verge?). No alarm. Date 1680s-90s? Lantern clock: Tho. Power Wellingborow. Auction 2001. No alarm. Verge escapement (replaced?). Wider chapter ring. Date 1680s-90s. Lantern clock: Thomas Power Wellingborow. Clock pictured here. Formerly with alarmwork. Original verge escapement. Wider chapter ring. Date 1680s-90s? Longcase clock: Thomas Power Wellingborow. Wider chapter ring. Plated movement not otherwise comparable with lantern clocks. Date late 1690s? 1. Thomas Power lantern clock (number 8 on the list) seen from the front in unrestored condition. Click for closer view. 2. 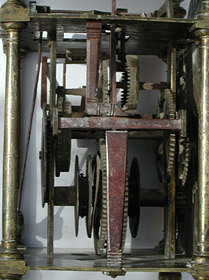 Thomas Power lantern clock (number 8 on the list) showing the movement from the left hand side, unrestored. Click for closer view. Thomas Power's method of signing his clocks varies over the years and it looks as if his earlier clocks are those signed without a placename. The above sequence is partly based on that assumption, but also on style, where adequate evidence of this exists. It might even be that he worked in his earlier years in some other rural location as yet unknown, and that he began to include Wellingborough in his signature only from the time that he moved to work there - if so, he was certainly there by the late 1670s. At present we do not know which, and we may never know. We do now know that it was common for a clockmaker working in a small or little-known rural location to omit the placename from his clocks - something not found in the work of those located in towns and cities. There were two reasons for this. One was probably because few people more than twenty miles distant would ever have heard of a small hamlet. This always reminds me of a remark in some old book, I think it was Britten, who on being told about a clock signed 'Thomas Lister Luddenden fecit' that it must be an error as he could locate no place with such an unlikely name! The Snow family of clockmakers worked in the hamlet of Padside, only about two miles from my own home, for about eighty years before they began to put a placename on their clocks. Even today only local people would know of its existence. And a good number of the Snow family clocks are not even signed on the dial, but in a hidden-away spot inside the movement - the reason for which is explained below. The second reason for the omission of a placename was that rural makers often took their clocks to sell in the markets of more than one town in the locality, and so did not want to pin themselves down to the one location. Some such makers from remote hamlets who did put placenames on their clocks often signed them as if working at two or three different places simultaneously, whereas they may never have lived in more than the one home all their lives -and that perhaps not even at any of the places signed on their clocks. Some rural makers held a weekly 'surgery' in nearby towns on market day, usually in a tavern. Added to this complication was the fact that many local towns had by-laws prohibiting outsiders from trading there in order to protect local trade, and outsiders deliberately flouting the law by selling their goods there, sometimes felt it wise to sell them unsigned to help avoid detection. It was sometimes the case that clockmakers in small and sometimes remote hamlets had no other means of selling their clocks than to take them to some nearby town on market day. Interesting evidence exists about one well-known eccentric clockmaker, John Sanderson of Wigton in Cumberland, who was a sinner in his youth and an obsessive repentant and sometime Quaker ever after. Quakers often felt the need to travel to distant meetings to help spread the word. Sanderson went to just such a meeting in Edinburgh with fellow Quakers (including Quaker clockmaker Isaac Hadwen) in 1713 and in 1715 and perhaps at other times too. But Sanderson could never resist the chance to make a buck and he was caught selling his clocks there in 1715 by officers of the local 'Guild of Hammermen', who ran a closed-shop trade protection organisation deliberately intended to keep out impudent 'foreigners', i.e. anyone not local and not a member of the Guild, such as John Sanderson! The records show that two of his clocks were confiscated by the Guild only to be returned to him on payment of a fine of one pound and an undertaking that he would not repeat the offence. Not even a penny-pinching zealot like Sanderson could put one over on a Scotsman. Sanderson was probably caught red-handed but was readily identifiable because his clocks bore his name. A handful of clocks are known dating from shortly after this date, which were clearly made in John Sanderson's highly-distinctive style, and which bear the name 'Jeremiah Sanderson'. Extensive research has established that there was no such person. It was probably as a direct consequence of the Edinburgh incident that John Sanderson, who always considered himself to be a bit of a Jeremiah, made clocks which were signed by a clockmaker who never existed. These may have been made purposely to sell in forbidden markets in such a way that they could not be traced back to him. .. if the above suggested sequence is correct, then he signed his earlier clocks with no town, but with the Latin phrase 'hoc fabricavit', which is a pompously artistic way of saying 'made this'. This sort of little touch of vanity is most often found early in a clockmaker's career, when his talents are newly released into the world and he is full of pride in his own abilities. Later on he often acquired a little modesty and toned things down a little. I think I am right in saying that this particular Latin phrase is unique amongst clockmakers to Thomas Power, and even the mighty Fromanteel and Tompion did not blow their own trumpets quite so loudly. So initially he seems to have included his Latin tag in his oldest two clocks without any placename. By number three and four (of those known to me of course) he includes the placename (prefaced now even more pompously by the Latin/French 'de') and his Latin tag. By number five he has dropped the Latin tag but has kept the 'de' still to display his artistic talents and his knowledge of dog Latin, which is in fact more akin to French than Latin. By number six he has switched from 'de' to 'in' Wellingborow. By number 7, 8 and 9 he has down to earth a little and uses the name and town only. three clocks & cases £9. 00. 00.
three other clocks without cases £3. 15. 00.
a spring clock £4. 00. 00. We never really know whether inventory values were purposely undervalued, though I strongly suspect they were, as a form of death duty was payable on the value. His total worldly wealth amounted to £53.00, or so it was said. Spring clocks, we call them bracket clocks today, were pretty costly things, and the only one he had in stock was valued at £4.00. Longcase clocks with case (of which he had three in stock) were valued at three pounds each, no doubt thirty-hour clocks in simple cases of oak or even pine. We know from further down that empty cases themselves were valued at only 7s 6d (38 new pence), which makes the clock content only, that is the value of the longcase thirty-hour dial-with-movement, about £2.60 pence each. Yet there is the entry for the 'other' clocks without cases, which are valued at only £1.25 each. This seems to imply they are not simply longcase clocks without cases but a different kind, presumably being lantern clocks. We know lantern clocks typically retailed in the mid seventeenth century at about £3.00 to £3.50. So these are written well down in value. Thomas's widow, Sarah, herself died only two months later, and a new inventory was taken of the goods she left - which of course as far as clocks were concerned were the same ones Thomas had left, less any she might have been able to sell in the meantime. Reason would suggest she should have had less value of goods than Thomas. Oddly enough the value of Sarah's goods amounted to £83.00, thirty pounds more than Thomas's goods, yet from the inventory taking she seems to have sold off a few clocks! There is something a bit fishy here. It may be that the first inventory was lower than reasonable. One of the people who valued Thomas's goods was John Wainwright. He was a clockmaker almost certainly working at this time for Thomas Power, though working for himself in Wellingborough after 1709, when Power's death left an opening in the trade. Wainwright almost certainly would have felt obliged to keep the values low for the sake of the widow of his late master. Sarah's clocks are grouped together with tools in such a way that comparison with Thomas's goods is impossible - and perhaps that was the intention to avoid embarrassing the earlier inventory takers. The spring clocks and case are still there, but we now hear of '1 week clock unfinished and 1 30 hour clock also unfinished', which seem to have been overlooked before. There are also four unfinished and empty clock cases, when only two were counted before, and no mention of them being unfinished. Also in Sarah's goods were 'two ordinary clocks, 1 in a head case, 1 unfinished'. These are presumably lantern clocks, one in a hooded case, the type we now call a hooded clock. Unfortunately many items are lumped together so that we cannot get at the individual values. The unfinished clocks are interesting, as none were mentioned as unfinished two months earlier. Could it be that John Wainwright had continued working for Sarah in the months after his master died, and that these unfinished clocks were some John had been making, still presumably under the name of his late master? We know a clockmaker could make a clock every two weeks, leaving time for John Wainwright to have made at least four. Of course it is only conjecture, but it might just be that one or two clocks exist by Thomas Power, which were constructed after the clockmaker died! And it might be that one or more of those listed above could be amongst them.